Would you like to boost your body confidence to help you boost your brand? Sounds great right? Let’s dig into Rachel Swann’s Guest Blog…. If you’re a female entrepreneur who worries about popping your photo in your branding or getting out there on video, then you’re not alone. A whopping 97% of women don’t like how they look! So, if you’re worrying about your looks it can feel daunting putting yourself into your brand. As any business coach worth their salt will tell you though, if you’re a small business and especially if you’re a solo entrepreneur, your customers want to get behind your logo and connect with you and as such you’re going to have to get used to putting your image out there. Body confidence is a little like a muscle; you need to keep working on it, day by day and eventually you’ll see results. 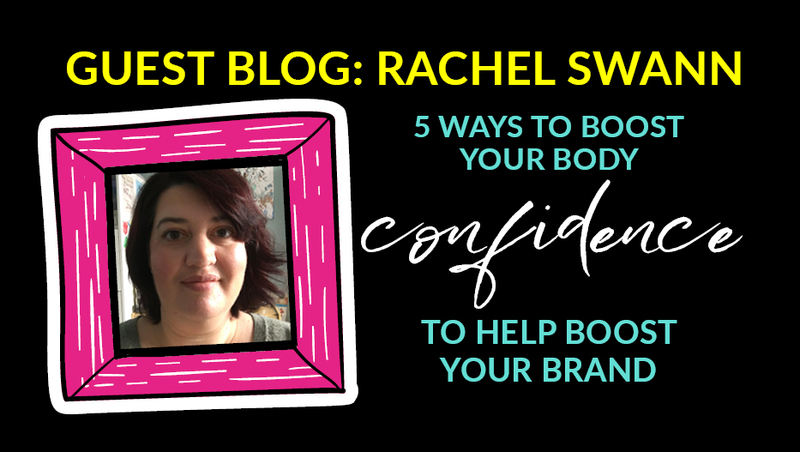 I’ve put together a few ideas for you to boost your body confidence muscle – soon you’ll be posting selfies, getting out there on video and having your image as a significant part of your brand – it will boost your brand significantly. The key to moving forwards on anything is accepting what is. The reason we feel uncomfortable with the way we look is often that we want things to be a different way and we are avoiding dealing with what actually is. By looking at yourself in the mirror, you can begin to accept how you look. Start by taking just a few seconds to look right into your own eyes and hold your own gaze and build up a few more seconds each day. Once you’ve been practising looking at yourself you can start on this exercise. As you look at yourself, listen for the words that spring into your head. If you can, write them down or simply try to remember what came up for you. Use the words and phrases to journal around and work out what it is that is coming up for you in terms of emotions and feelings around your image, your looks and anything else. Often the issues are around other people’s perceptions, being good enough and being expert enough – especially when it comes to your business. Once you have picked out what it is that’s holding you back, ask yourself if the narrative is true (hint: it probably isn’t). As you become more and more used to looking at yourself in the mirror and as you begin to understand what it is that’s really holding you back then you can begin to change the narrative. As you look in the mirror try to see your brilliance and your general awesomeness. This isn’t necessarily about your looks just yet but remembering the expertise that you have and the reasons why you are good at being you, in your general life as well as in business. As you get better at this you can begin to say them out loud – a little like affirmations. When you started your business it was to change lives in some way. Whether you’re helping people in their personal or business life, whatever you’re doing you’re solving a problem and making someone’s life easier. These people are still out there and still want to see you. They want to be able to connect with you and have you sort out their problem and they probably aren’t in the slightest bit bothered about how you look on camera, whether you pull faces in your videos or if your ears are level! If you’re selling to women, they’re probably too busy worrying about their own body imperfections! Connect with your why and remember that, regardless of your looks, you are here to serve. Repeat those reasons why you’re the best person for the job and take a deep breath. I borrowed that quote from Amy Cuddy and she’s right! If you’re still not quite feeling it, then fake that confidence. Do it anyway. Take the selfie, do the video, pretend you feel confident until you actually start to feel confident. Take baby steps. You don’t need to launch straight into a half hour Facebook live but my advice would be not to over edit or overthink your images and videos because that inner voice may come back and sabotage your efforts. Think about what one step you can take today that will help you on the path to body confidence and confidence in being seen in your branding. And if you need a little more help you can download my free audio masterclass “Body Confidence Without Compromise” here. Rachel is founder and head cheerleader at Beautiful Swans. She is dedicated to helping you shake off the shackles of yo-yo dieting, repairing your relationship with food, strengthening your resilience and confidence and doing all this whilst falling in love with your body, yourself and your life.